I am absolutely loving this age/stage with the girls right now. They really are happy girls and really funny too! Every day they pick up on something different, learn a new word, focus on something new, and really amaze us with their development. They each have such unique personalities, but still following quite in suit of how they have been since birth. We spend a lot more time laughing and smiling these days (mommy and daddy do too) and look forward to each morning they wake up! – We LOVE Elmo. This has not changed much over the months, but I watch a lot of Sesame Street in the mornings. I actually enjoy it over Dr. Phil which is too depressing at 9 a.m. We can’t quite say Elmo just yet but they know who he is for sure! I still laugh when they say, “Brought to you by the number 10.” Sesame Street is genius! – We LOVE swimming. They scare us to death because they literally have no fear. We don’t take them swimming that often because it is so much work. We make sure we have one adult for every kiddo. We will be doing swimming lessons next summer for sure. We are a lot less stressed playing the sprinkler in the backyard. – They have become sort of attached to their blankies which is something new. They have had these cute little blankies with their names on them since birth, but just recently they are carrying them around the house or they go get them out of their cribs. Maybe its a security thing or maybe they are realizing what is theirs and they take ownership of that. What floors me is that they know what color of blankie belongs to who. They will even bring their sister their blankie and get the color right! – They are amazing eaters! Typically, the growth of a toddler slows after age one. Doc says that the first year of life is typically the fastest growing for a baby and toddlers tend to see more growth over a longer period of time. Not my girls! Emily has gained a whole pound in a month which is awesome for her. These girl really love most things I put on their table. Camdyn is a little picky at times, but overall they are content with most foods. They love popsicles and ice cream bites called Dibs. And yes, I do feed them healthy foods. They eat better than I do! – The other little things I notice is them helping each other with toys or looking at books together. Melts me. Emily still is my book-worm, Avery is still my busy body who never sits down and Camdyn is still my snuggle bunny. She loves to be held them most. Bryan and I took them to the parade yesterday. It is always a lot of work to go anywhere but we try to do it with an attitude that is positive…and make sure we have grandparents close by! 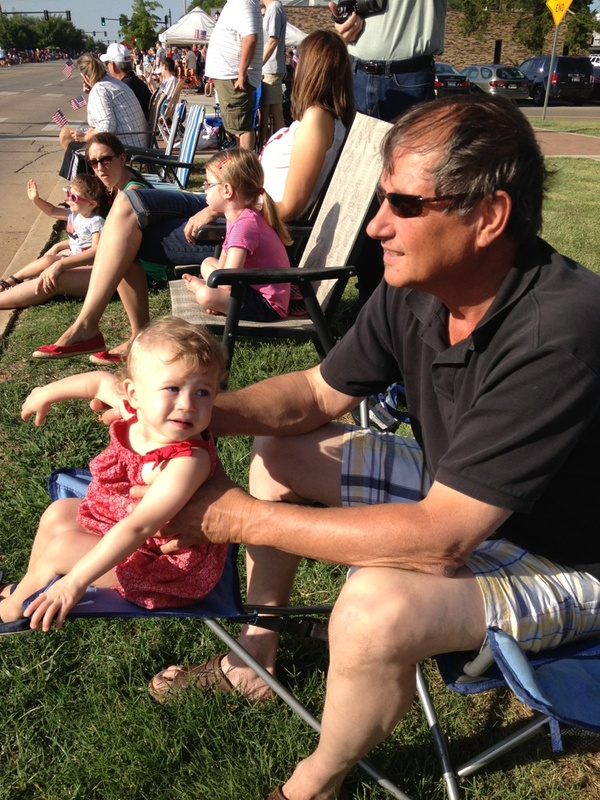 My parents met us the Edmond parade. 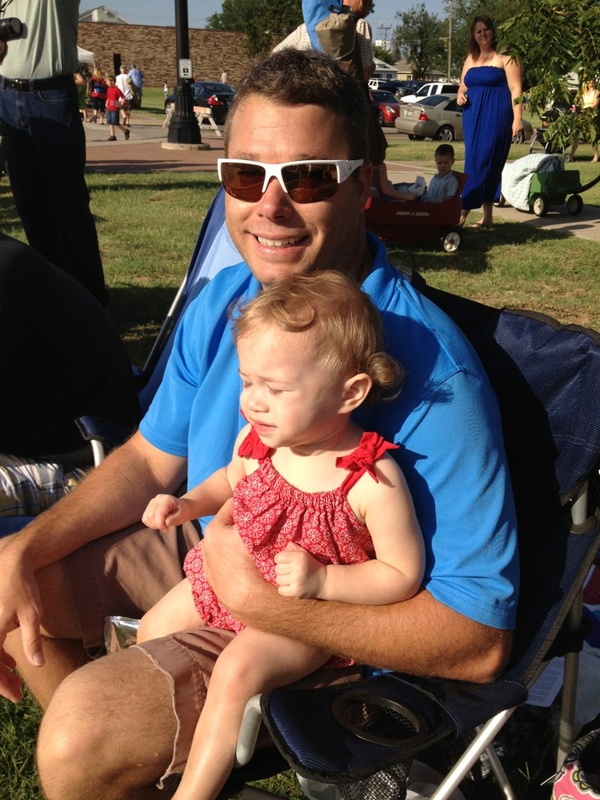 They loved it and really enjoyed looking at the people, my girls that is…Not Mimi and Papa :). Emily was the most content. See this picture with her and her Papa. I have had a lot of people ask me lately if things are getting easier…And the answer is YES! Of course, you replace old challenges with new challenges but as of right now I will take this age over the infant stages any day. When you don’t have the typical situation with a newborn or even infants it is really hard to embrace that stage. It was a memorable phase of our lives, but it was the hardest time of my life. I love seeing the girls play, laugh, smile and really become attached to me, Bryan and their family. I love seeing their relationships with each other development. Their behavior and personalities are more predictable and that makes things a little easier as well. We have some dear friends who have a new baby in the NICU right now. We are saying many prayers for him to heal and get stronger each day so he can come home soon. NICU life is so incredibly hard. We visited them and so many memories came rushing back for Bryan and I. The smell, scrubbing in, the alarms, the cords on the babies, the stress…Bryan said it best when he said its a love hate relationship. We had amazing people helping our babies and that made all the difference. But, I never want to go back to that time in our lives again and I never want to leave a hospital without my girls ever again either. It is the hardest thing for a mother. On a happier side note, we are moving along on our new house. We are so excited and have so much to do. Bryan and I love to visit the construction and it is awesome to envision our little family living there soon. I can’t imagine the girls each having their own room and us having a little more dedicated space for toys and entertaining. We are still looking for a buyer for our current house. We have had several showings, which is always a fun duty keeping it clean, loading the girls up and making sure it looks great. But, it’s all temporary. 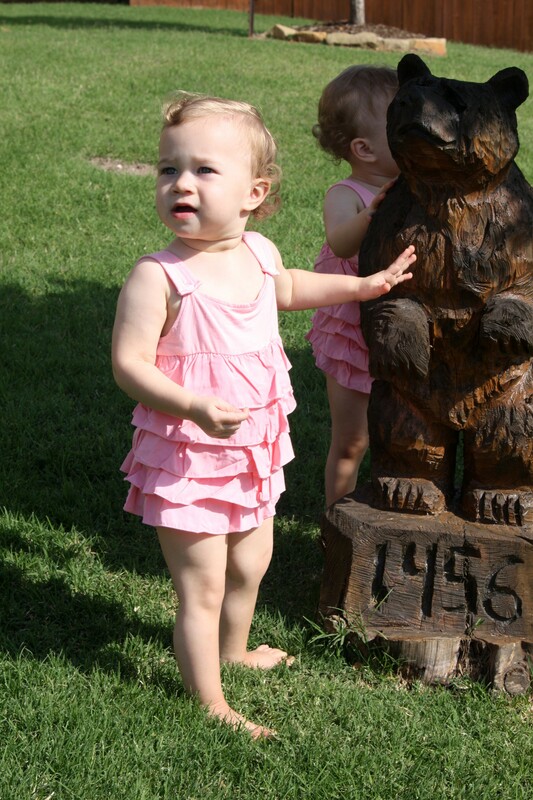 This last pic is Miss A next to our wood carved bear at our house. They love to go look at him! Hope everyone is having a fantastic summer! The Coys are for sure!